IFU:​ ​Type 1 diabetes mellitus Route: By injection Dosage: U-100 Action: lowers blood glucose by stimulating peripheral glucose uptake by skeletal muscle and fat, and by inhibiting hepatic glucose production. Adverse​ ​Reaction: Itching, skin rash, wheezing, trouble breathing, fast heart rate, and sweating. Interactions: Gatifloxacin, tequin, and tequin teqpaq. Januvia​(Sitagliptin) Pronunciation: Sit-a-glip-tin Classification:​ DPP-4 inhibitor​ IFU:​ ​Type 2 diabetes mellitus Route: Orally Dosage: 25 mg, 50 mg, and 100 mg. Action:​ Inhibits the enzyme dipeptidyl peptidase-4 (DPP-4), which slows the inactivation of incretin hormones, resulting in increased levels of active incretin hormones. Adverse​ ​Reaction: Headache, pancreatitis, nausea, diarrhea, etc. Interactions:​ Insulin, glyburide, glipizide, and glimepiride. Lantus​(Insulin Glargine) Pronunciation: Glar-gen Classification:​ insulin​ ​ IFU:​ ​Type 1 diabetes mellitus Route: By injection Dosage: 100 units/ml Action: ​Promotes glucose transport, which stimulates carbohydrate metabolism in skeletal and cardiac muscle and adipose tissue. Adverse​ ​Reaction​: urticaria, rash, pruritus, redness, stinging, or warmth at injection site. 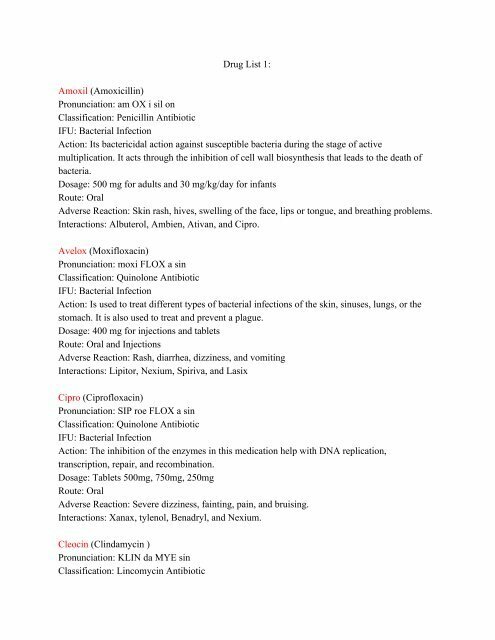 Interactions: ​Acetazolamide, albuterol, antiretrovirals, asparaginase, calcitonin, etc. NovoLog​(Insulin aspart) Pronunciation: in-su-lin as-spart Classification:​ ​ insulin IFU: ​Type 1 diabetes mellitus​ Route: By injection Dosage: 100 units/ml Action: Lowers blood glucose by stimulating glucose uptake in skeletal muscle and fat, and inhibiting hepatic glucose production. Adverse​ ​Reaction: lipodystrophy, pruritus, erythema, swelling. Page 17: Dosage: prefilled syringes- 30mg/0.